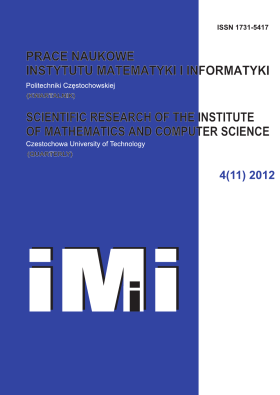 Scientific Research of the Institute of Mathematics and Computer Science (SRIMCS), established in 2002, was the first periodical of the Institute of Mathematics and Computer Science of the Czestochowa University of Technology. The first Editor-in-chief of this journal was Professor Bohdan Mochnacki. - Workshop of the Institute of Mathematics and Computer Science (in Polih: Sympozjum Instytutu Matamatyki i Informatyki - SIMI). Summing up, 412 articles in 18 issues of the SRIMCS in years 2002-2012 have been published. The journal is on the list of scientific journals of the Polish Ministry of Science and Higher Education. Each paper was awarded with 5 points (2012), 6 points (2010-2011), 4 points (2007-2009). Since 2013, the SRIMCS has been entitled the Journal of Applied Mathematics and Computational Mechanics.